TotalPond’s 400 GPH Floating Fountain with White LED Lights is a 3-in-1 pond system that pumps, aerates, and illuminates your pond. Simply place the floating fountain in your pond and plug it in to create water effects up to 4 ft. in height. Easily and securely position the floating fountain in your pond using the anchor ring. The Floating Fountain with White Lights includes an energy efficient 400 GPH pump, 12 built-in white LED lights, waterspray nozzle, and pumpshield® mesh barrier bag to prevent large debris from clogging the pump. To create an even more unique water effect, use nozzle heads from the TotalPond Large Nozzle Kit. TotalPond’s 400 GPH Floating Fountain with White LED Lights is a 3-in-1 pond system that pumps, aerates, and illuminates your pond. 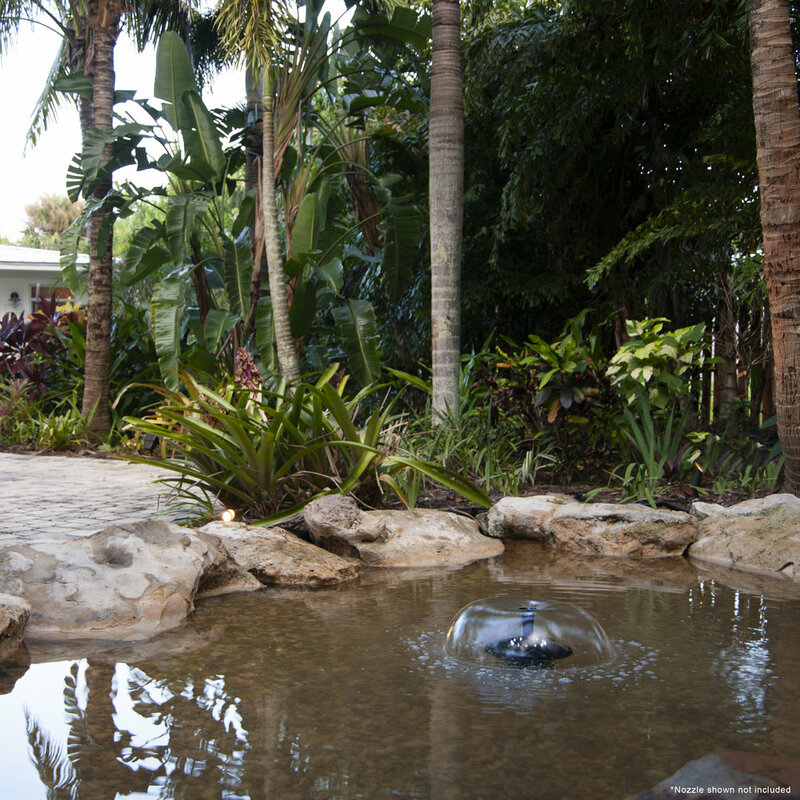 Simply place the floating fountain in your pond and plug it in to create water effects up to 4 ft. in height. Easily and securely position the floating fountain in your pond using the anchor ring. The Floating Fountain with White Lights includes an energy efficient 400 GPH pump, a light ring with 12 white LED lights, waterspray nozzle, and pumpshield® mesh barrier bag to prevent large debris from clogging the pump. To create an even more unique water effect, use nozzle heads from the TotalPond Large Nozzle Kit. The 400 GPH Floating Fountain with White LED Lights is a 3-in-1 pond system that pumps, aerates, and illuminates pond water. Creates water effects up to 4 ft. in height. Anchor ring allows you to secure the 400 GPH Floating Fountain in your pond. Compatible with Large Nozzle Kit (#52235/N16100) nozzle heads. This product is not recommended for use in heavily chlorinated water or water with high pH levels. We recommend its use in fresh water temperatures ranging from 41°F to 86°F. No tubing is required to use this product. Dimensions: 11 x 11 x 11 in.